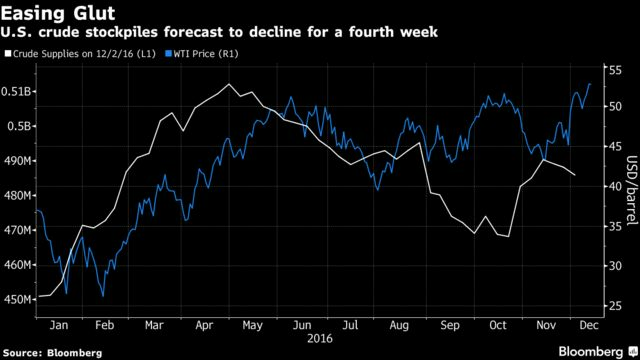 Unicredit plans a $13.8 billion stock sale, the IEA says the OPEC deal will lead to an oil-supply deficit, and Trump makes decisions. Here are some of the things people in markets are talking about today. Italy’s biggest bank, Unicredit SpA, is planning to raise 13 billion euros ($13.8 billion), sell bad loans, and shed an additional 6,500 jobs to boost capital levels and profitability. Shares in the bank trading in Milan were 9.25 percent higher at 4:33 a.m. ET in a volatile morning session. For newly reappointed Finance Minister Pier Carlo Padoan, the problems with Italian banks extend well beyond Unicredit, with Banca Monte dei Paschi di Siena SpA now making a last-ditch effort to avoid a state rescue. The International Energy Agency said that global oil markets will move into a supply deficit in the first half of next year as producers follow through on the production deal struck over the weekend. A ramp-up in shale production could threaten the IEA’s forecast, though a big increase in the U.S. oil patch is expected to take a minimum of six months to hit the market. A barrel of West Texas Intermediate for January delivery was trading at $53.01 as of 5:08 a.m. ET. President-elect Donald Trump said, in a series of tweets, that he will put his sons Don and Eric in charge of his businesses by Jan. 20, while offering no information on his own role. He had previously promised to reveal details of how he would deal with his business interests by Dec. 15, a deadline his transition team said he will miss due to time taken on filling administration posts. Trump is set to announce the nomination of Exxon Mobil Corp. CEO Rex Tillerson for U.S. secretary of state later today, which is likely to set off a confirmation battle with members of his own party in the U.S. Senate. Overnight, the MSCI Asia Pacific Index advanced 0.3 percent, while Japan’s Topix index added 0.6 percent as the yen held above 115 to the dollar. In Europe, the Stoxx 600 Index was 0.7 percent higher at 5:19 a.m ET as Italian banks rallied and investors focus on tomorrow’s Fed decision. S&P 500 futures gained 0.2 percent as the index looks to recover from its first decline in seven sessions yesterday. Inflation in the U.K. rose 1.2 percent in November, the fastest pace since October 2014, as gasoline and clothing prices jumped. In Washington, the two-day Federal Open Markets Committee begins today, with markets certain of a rate hike announcement tomorrow. Investors will be looking for clues as to how Trump’s presidential win might impact the Fed’s outlook when Chair Janet Yellen gives her statement to the press after that decision.